Ehrlich, Stacy B. et al. 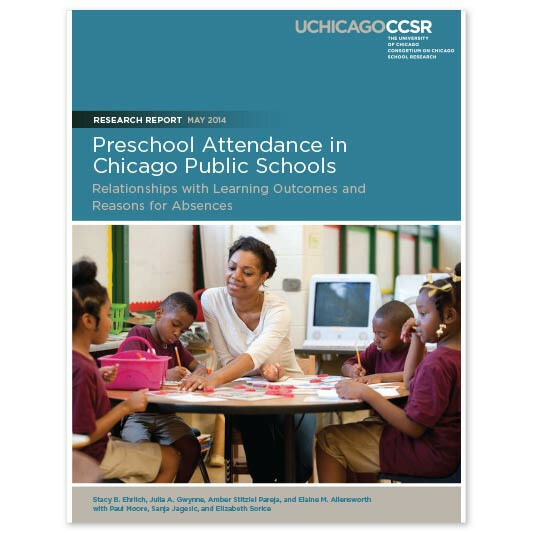 Preschool Attendance in Chicago Public Schools: Relationships with Learning Outcomes and Reasons for Absences, University of Chicago, Consortium on Chicago School Research, May 2014. This report highlights the critical importance of consistent preschool attendance. Students who attend preschool regularly are significantly more likely than chronically absent preschoolers to be ready for kindergarten and to attend school regularly in later grades, the report finds. The study, which follows 25,000 three- and four-year-olds served by Chicago Public Schools (CPS) school-based preschool programs, finds that chronic absenteeism is rampant among preschoolers in Chicago. In 2011-2012, almost half of 3-year-olds and more than one-third of 4-year-olds missed at least 10 percent of the school year.